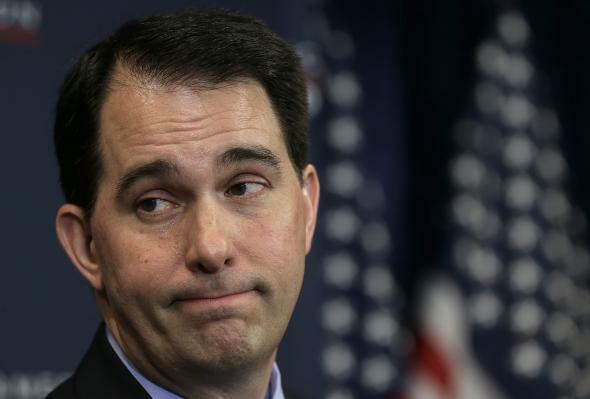 Liz Mair blowup: Conservatives blast Scott Walker for losing a staffer over tweets. Caved, then blasted: Wisconsin Gov. Scott Walker. Memo to potential presidential campaign staffers: Never say anything bad about Iowa. Or, to be safe, just don’t say anything about Iowa at all. What was Deace referring to? During the Iowa Freedom Summit in January—where Walker delivered a hugely well-received speech that helped him shoot to the top of 2016 Republican primary polls—Mair tweeted criticism of Iowa’s first-in-the-nation status and of the rhetoric of Iowa Rep. Steve King and other immigration hard-liners. In other news, I see Iowa is once again embarrassing itself, and the GOP, this morning. Thanks, guys. On Tuesday, shortly before 5 p.m., the New York Times ran a story quoting Iowa state Republican Chairman Jeff Kauffman, who said Mair “doesn’t have a clue what Iowa’s all about” and that Walker should fire her. That same story also quoted the co-chairman of a county Republican Party and the co-chairman of the state party saying similar things. At 12:03 a.m. Wednesday, the AP reported that Mair was no longer a member of Walker’s campaign. Mair said a lot more on Twitter this morning, which Twitchy helpfully aggregated. “I do find some of the things Steve King says on immigration embarrassing and factually dubious,” she tweeted. “I also think the fact that King is held out as the only real force in Iowa and representative of what Iowans think is embarrassing for Iowa,” she added. Here’s what I find most interesting about this situation: Infighting on the right is no surprise whatsoever. But that infighting usually pits establishment, big-business-friendly, moderate Republicans against grassroots, activism-oriented, Tea Party-friendly insurgents. Typically it’s the people who want to #FireBoehner against the Republicans who really, really, really want to pass immigration reform. L’Affair Mair was different. When the Breitbart story came out, many prominent red-meat conservative figures came to her defense. RedState editor Erick Erickson, who is often a blistering critic of the Republican Party’s leadership, wrote an impassioned post on his site defending her. He noted that he parts with Mair on many public policy issues but that she doesn’t let her beliefs keep her from working effectively for candidates she might disagree with. He updated the post after Mair and Walker parted ways. Jonah Goldberg, a popular conservative writer at National Review (disclosure: I used to work at National Review, and Jonah is a former colleague), made a similar argument. On Twitter, there was a similar outpouring of support for Mair. So the question this raises is simple: For conservatives on the right looking to move the GOP in their direction, how much purity is required? Will conservative activists direct their outrage in surgical strikes, targeting candidates and policymakers who actively push for policies antithetical to their principles? Or will they sharpen their pitchforks for anyone who’s ever been on the wrong side of the immigration debate—regardless of whether their current work involves policymaking or not? To what extent will activists try to shape the staff makeup of the Republican 2016 presidential contenders? And to what extent will the contenders listen?